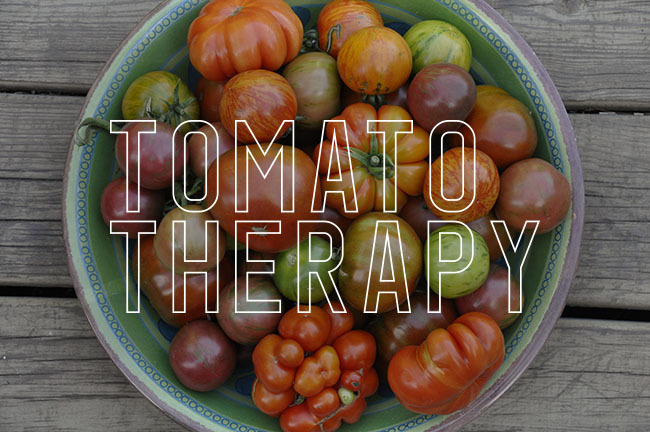 If you're like me, you are waiting and waiting for the gardening season to begin. 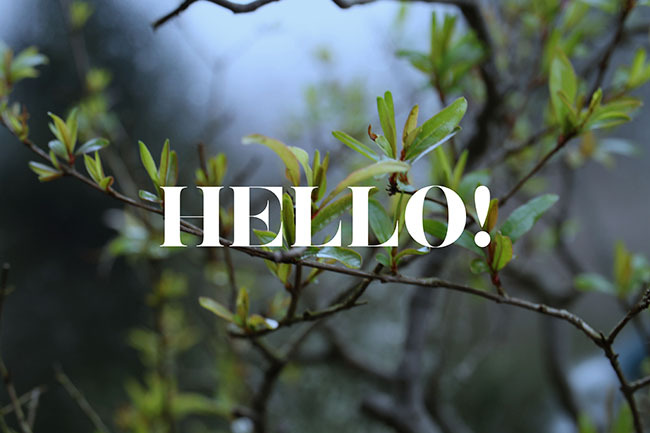 Here in New England spring is a bit late arriving, which on one hand is helpful for procrastinators like me, but also worrysome as most of us know that it will probably swing from cold, snowy weather and chilly, near-freezing temperatures to hot and humid weather practically overnight! But it is a good time to catch up on reading and inspiration, and I can think of no better way than with a good book. Just in time, a new book has arrived written by two employees of the New England Wildflower Society. 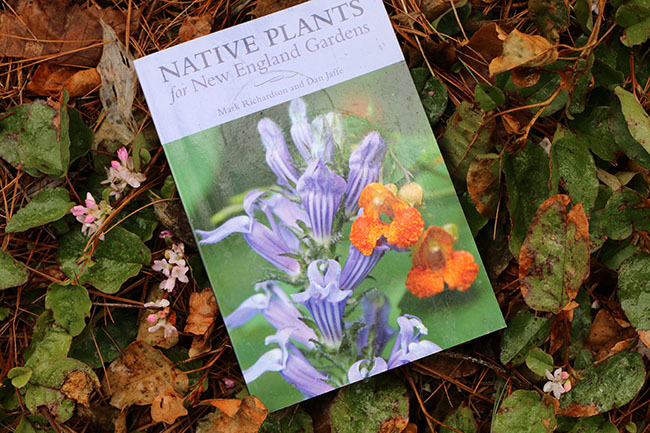 'NATIVE PLANTS FOR NEW ENGLAND GARDENS' by New England Wildflower Society's Botanic Garden Director MARK RICHARDSON and my good friend DAN JAFFE, propagator and stock bed grower for the New England Wild Flower Society who also photographed the book. I always enjoy books written by plant people, and since these two are horticultural geeks from a leading botanic garden and plant preservation society, well- you can imagine the valuable information contained within the covers of this book. 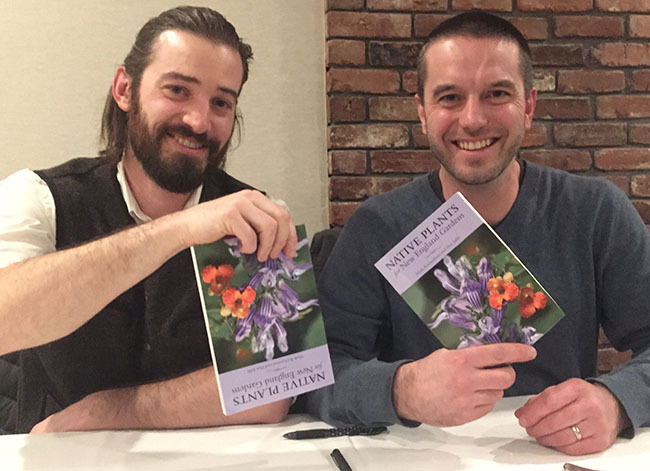 Dan Jaffe and Mark Richardson - authors of the new book Native Plants for New England Gardens at their book signing last month in Framingham, MA. If you love wildflowers, native plants, ferns, shrubs, trees and other native plants and wildflowers of not just New England, but much of the northeastern US and Canada, this book will become a valuable asset to your library. You can find the book on Amazon. 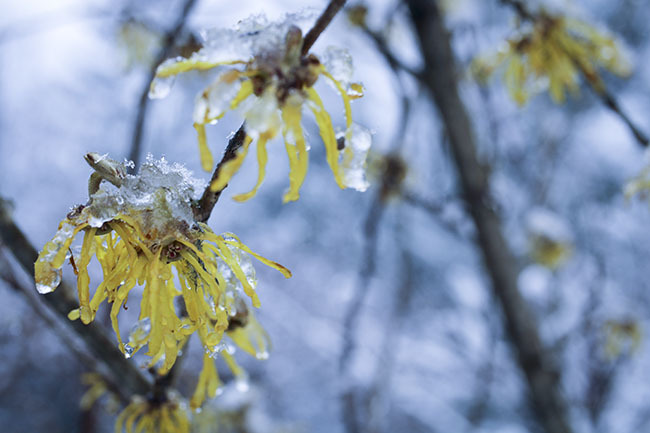 It breaks plants out by ecoregions for New England, but also by plants that are good for birds or shade, or if one wants to choose plants that are best as pollinators. Most readers will find the book inspirational, and helpful in making planting lists for their Northeastern US garden. It proves to be particularly useful if one is planning to set-up a pollinator garden, but it also could be used as a field-guide of sorts, if one is in need of identifying wildflowers. Mayflowers in our entrance garden of native woodland plants are seed-raised plants which have established themselves into a large colony that allows me to pick a few bunches if I so dared, even so, I rarely do. 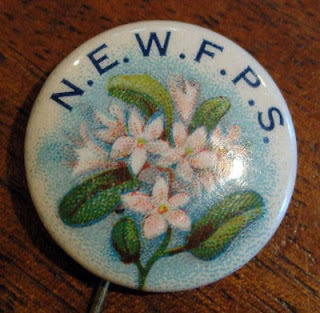 A button from around 1915 promoting the campaign. So after attending the book opening and talking with Dan Jaffe again, I became more curious about the New England Wildflower Society. I've been familiar with the society for years, after all, they are located not far from our garden but my knowledge of the society was slim. Mostly I thought of the society an organization that operated the beautiful Garden in the Woods, a public garden located in Framingham, MA about 30 minutes from use towards Boston. After spending some time with their executive director Debbi Edelstein over dinner a few weeks ago I realized that while I certainly knew about the society, I had no idea about some of the many initiatives they have accomplished or are undertaking. Debbie shared with me a few (well, more than a few!) of the many projects, missions and even the amazing history of the New England Wildflower Society. To say that I was blown away might sound cliche, but its the truth. I said: "I live just a half-hour away from all of this, and for some reason, I don't know anything about the history or these projects! It's embarasing! (then again, I;ve never been to the Arnold Arboretum either!). I now have a new appreciation for this old society which is much more than their well know 'Garden in the Woods' garden in Framingham MA, and more than just a plant society. SO much more. Consider the Seed Ark campaign - a 5 million dollar initiative to collect and permanently store the seeds of all the regions' imperiled plant species by the year 2020. Or their GoBotany website (OK, really, I should have known about that!). Pollinate New England (their response to the pollinator crisis) and Trillium collection which was granted a prestigious accreditation by the North American Plant Collections Consortium and the American Public Gardens Association Plant Collections Network (one of only 67 of the 500 plus public gardens in North America who have received this accreditation. That said, their popular TRILLIUM WEEK is coming up soon (May 6-12). Visit and see 21 of the 39 species of Trillium - perfect for nature lovers, plant lovers and anyone who wants to get into spring in a hurry. What I was most curious about however was how the society was founded and why. To know that story we have to go back in time a hundred and 20 years ago when few cared about wild flowers or native plants. Why should they? They were 'wild' and seemed endless. 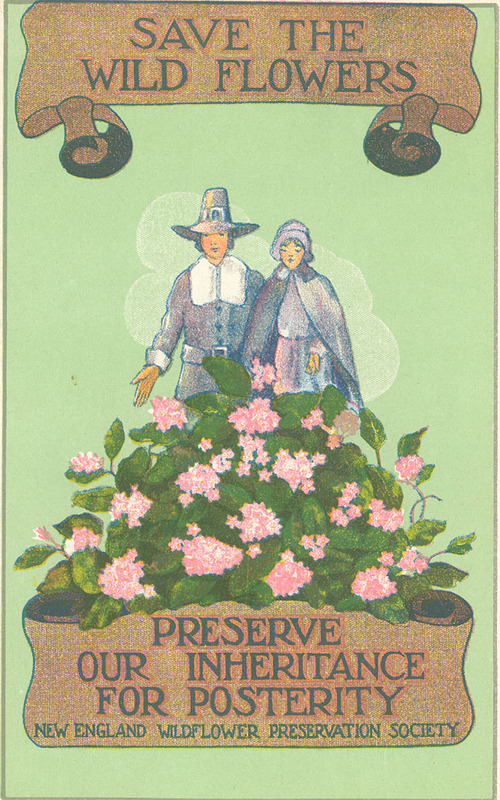 In the early 20th century the (then) New England Wildflower Preservation Society took on its first mission - that of public awareness, sharing a vision of the future. While I knew about some picking, as my dad would share with me what an issue it was even during his childhood in the 1910's and 1920's, I never realized the scale of woodland plant picking until I started looking at some old plant-lists from catalogs from the late 1800's. I turns out, I sort-of knew some of the histories of endangered wildflowers as my dad was very active with the Audubon society back in the 1930's and 1940's, and he illustrated many of the environmental issues of that era in pen and ink for newspapers (A trip to one of our closets upstairs and all I had to do was to pull out some flat files and it wasn't long before I found hints of what was happening with our native wildflowers of New England. Why save the wildflowers? 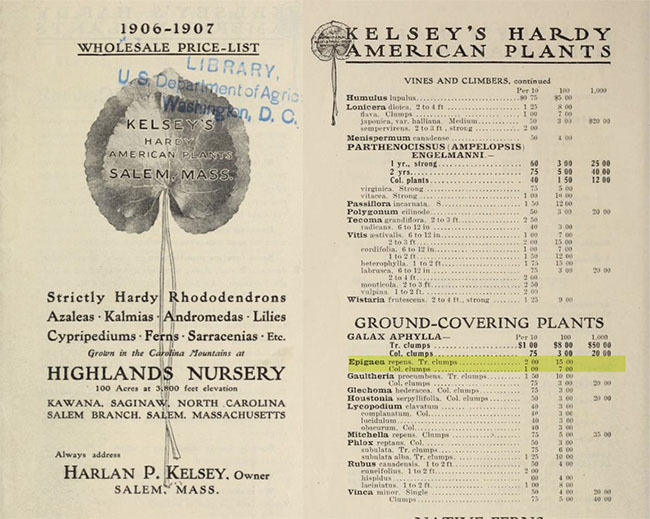 Here is one example of a catalog from the turn of the last century - notice the Epigeae repens at $20 for 1000 plants. This sort of mass collecting was common through the 19th and early 20th century. Even today some wild-collected trillium and other woodland wildflowers threaten populations. Debbi had explained to me that it was this indiscriminate picking wildflowers from the woodlands that became a rallying cry for the organization in the early days of environmental awareness (probably along with stopping the Victorian collecting of bird eggs and the collection of features for millinery use (hats) during the same period. Rampant wildflower collecting was quickly escalating and endangering the native populations. You can learn more about the amazing history and future plans as well as some of the many initiatives of the New England Wildflower Society here at their website. I think many of us forget how the nursery business used to work a hundred years ago. 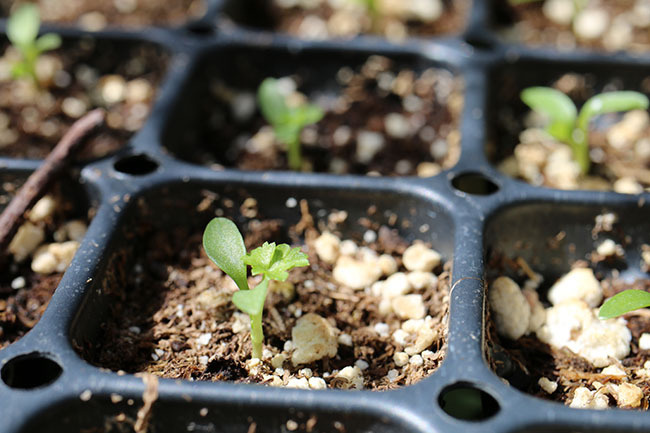 While many of us bemoan the advent of commercial nurseries, patented plants, plant breeding and mass-market propagation (Proven Winners, etc) and new propagation techniques like micro-propagation, plugs flown in from across the planet, we forget that plants were often collected in the wild and sold via plantlists. Particularly at risk were native woodland plants, which are often notoriously difficult to germinate and grow. Old plant catalogs often sold wild collected roots of rarities like trilliums, ferns and precious alpine or woodland plants that were collected in the forests of North America and sold both here and overseas. I dare admit here that there are a few nurseries who still might do this, but would never admit it, and I have heard rumors of even some well-known and respected plant enthusiasts who are still collecting plants like White Trillium (T. grandiflorum) for sale overseas to the UK where they are highly valued. The fragrance of Mayflowers can be described as sweet 'like cotton candy', and with warmer temperatures, the pale pink blooms as they age are lovely. Here in New England, there was a time when many gardeners would have dug a few plants especially the earliest wildflowers from the forests to set out into the home garden. If you were raised anywhere between Michigan, Quebec to the Carolinas you surely know about wild trillium species, lady slipper orchids, and bluebells and about the risks not just in damaging native populations but in trying to cultivate such plants in a home garden, and most will fail. No flowers were as sought out in spring as were the Mayflowers, however. 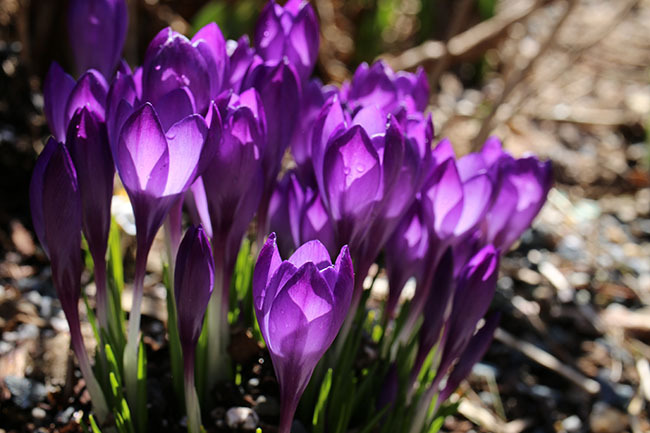 Most likely because they are the earliest blooming, sometimes in bloom as early as January but most likely by March. While not legally classified as 'endangered' they are a 'protected; or 'at risk' species in many states and provinces in the east where they grow on rocky outcroppings in acidic soil in open oak or pine woodlands. As such it is generally illegal and a fineable offense if one picks them. Known by another common name 'Trailing Arbutus', Epigeae repens is precious yet rarely seen. Truly the first flowers of spring if not winter, their fragrant tiny blossoms are often hidden by the leaves of the forest have been treasured for centuries, picked by the earliest colonists who surely needed some hope of spring sometimes as early as January (I've even had them bloom as early as Christmas in mind winters). I am grateful for a colony growing in our front garden which came to us via a botanist in Quebec who had been propagating the genus by seed for years. Our colony in the front garden is now nearly 20 years old but our soil is special here and undisturbed, highly acidic and under the cover of white pines and native blueberries. 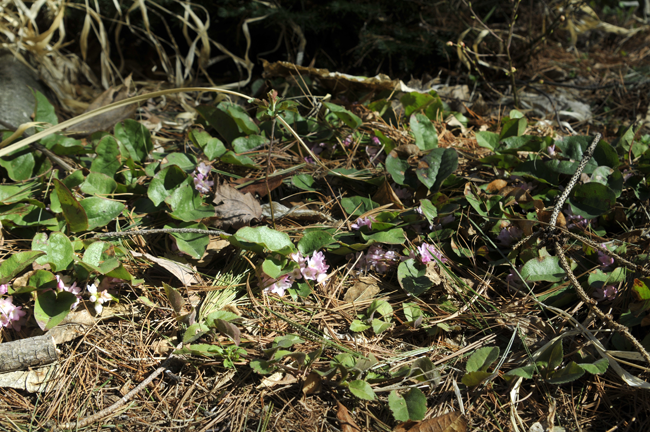 For those of us who were raised in New England, upstate New York, Eastern Canada like Nova Scotia, or even in Wisconsin or Michigan, know about the legendary Trailing Arbutus or Mayflowers (yes, of the famed Pilgrim ship name). Mayflowers also started a movement. 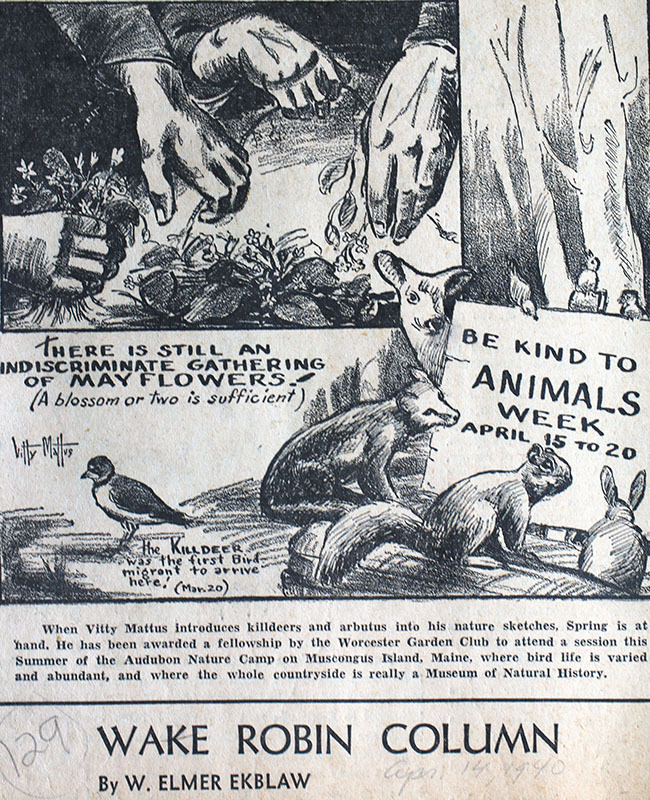 One of which helped start the New England Wild Flower Society back at the turn of the 20th century. You see, most 19th century Americans were nuts about the Trailing Arbutus. 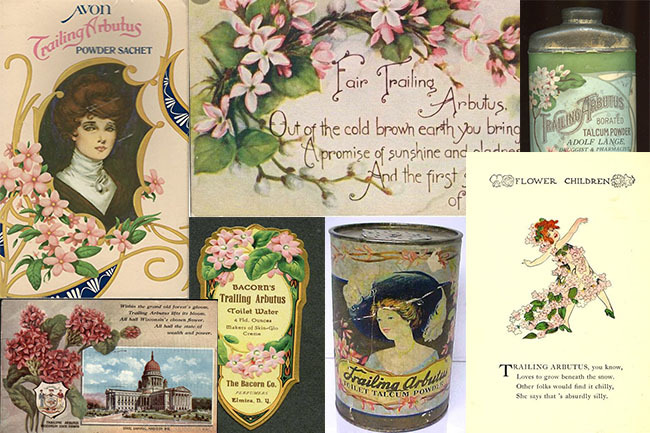 Because it represented early spring, hopefulness and perhaps because it was pink and the only thing blooming in the woods, it's scent was considered romantic and valued in products ranging from talcum powders to bathing salts. It;'s image was featured on Easter greeting cards and was often the flower associated with Mother's Day. It's no wonder that young children couldn't resist picking a bunch or two from the forests for their dear mum when the entire world seemed brown and dormant. 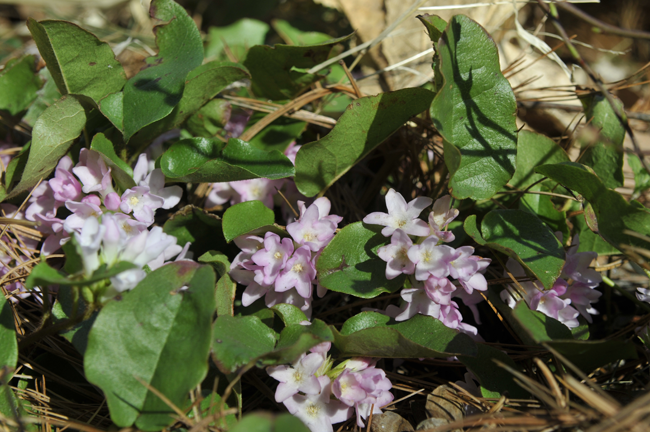 It was the magic of early-blooming fragrant flowers from the woods that fueled a craze in the 19th century for Trailing Arbutus - Epigeae repens, or the Mayflower. It scented everything from talcum powder to soap. 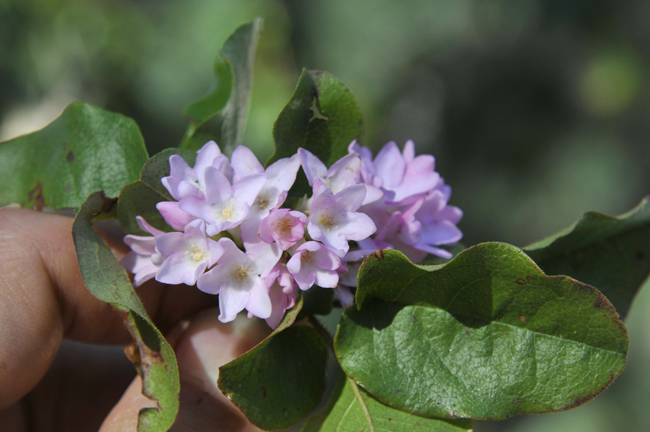 The real damage, however, came from the early florists, hikers, and nurserymen who picked trailing arbutus by the thousands, if not by the millions to sell as garden plants. A common practice until the mid 20th century. This mission was magnified by the early New England Wildflower Society then known in 1900 as the New England Wildflower Preservation Society. 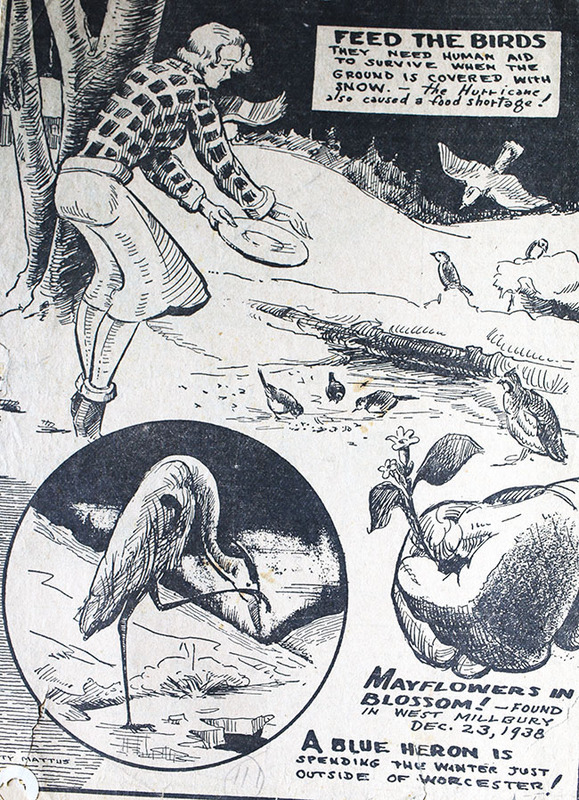 which was founded in 1900 and which is the US's oldest plant conservation organization. 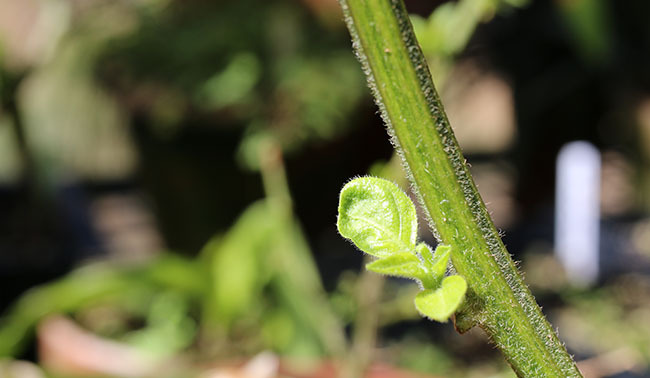 The risk Epigea faces is real, even more so today but not by picking as much as by its habitat being destroyed. Even our neighbor behind our house (who is clearly permit-averse), has plowed over and filled-in the wetland behind our house - all this for a swimming pool and a few sheds for his trucks and tools. I asked him if he knew that he was destroying some wetland habitat, but he just laughed. I would report him but it's also my position that neighbors don't do that sort of thing, so I am torn (of course, I am writing it here, though!). I can only imagine the plants that were lost here in our own backyard not to mention how often this happens elsewhere. My dad who was an illustrator back in the mid 20th century often featured the picking of Mayflowers with a very similar message. Here is one of his earlier sketches from the Newspaper from around 1946. All of this has reminded me of the drawing my dad had created for newspapers back in the 1930's and 1940's when the issue of picking wildflowers was still an issue. It's sad that 70 or 80 years later we are still seeing ignorant people destroying habitat. At least we arent indiscriminately digging up native plants as much as we were back then. 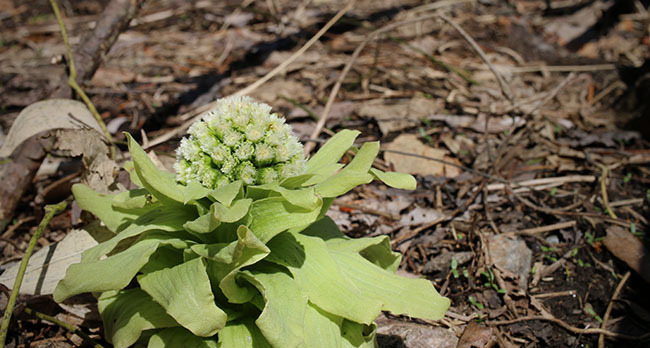 If you live in New England, consider visiting the New England Wildflower Society, visit The Garden in the Woods, especially in May during full spring glory, or support one of their many initiatives. Their new book Native Plants for New England Gardens is available on Amazon or from the New England Wildflower Society directly. I'm Back! OK, Spring, we're ready. 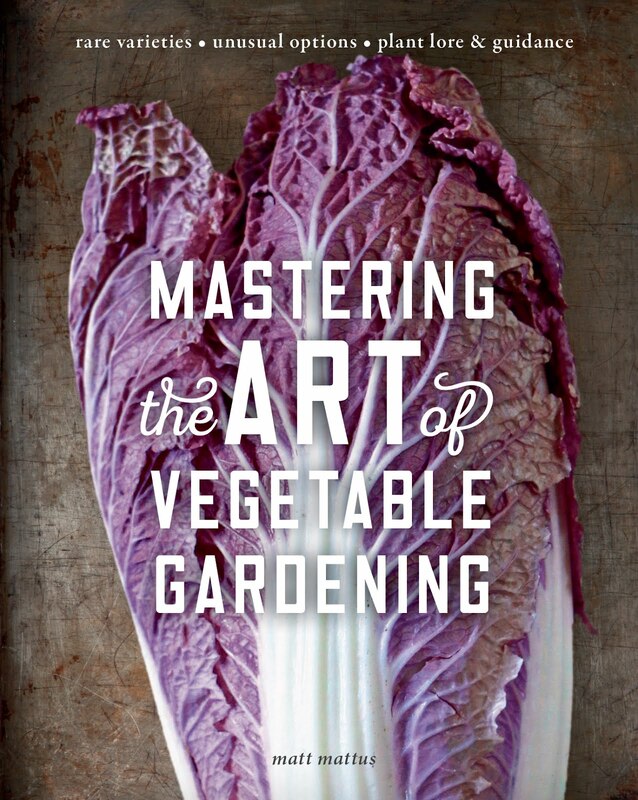 After a few month hiatus so that I can focus on finishing my upcoming book 'Mastering the Art of Vegetable Gardening' (Dec. 2018) I am back. I must be rusty at blogging as it took me three days to write this and then when I tried to post it this morning, I lost everything, and now have to rewrite the entire post. Well, maybe that will allow me to edit a bit more and keep this first 'return' post shorter. The Hammaellis are late this year, as everything is due to some extraordinarily cold weather, and a very snow winter here in New England. What else is new? This is where I've been spending my time lately. Sometimes for 14 hours a day for a few months. 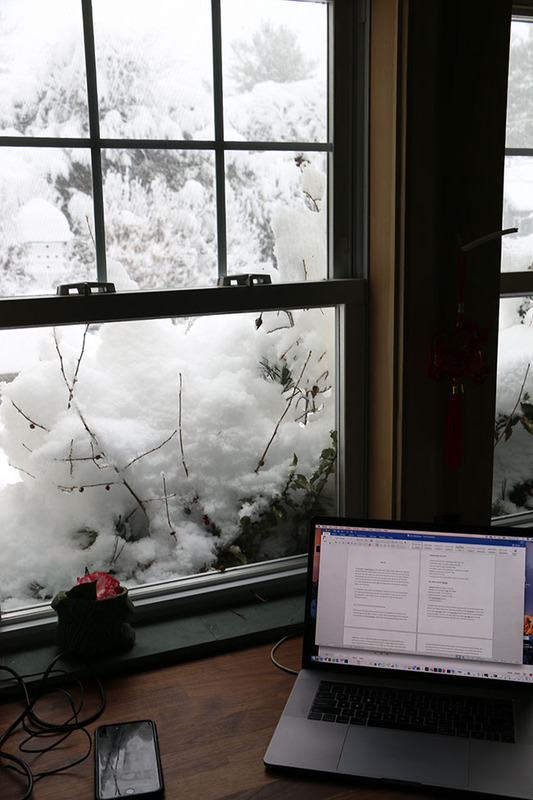 I thought that I would use my new office upstairs which I created out of a spare bedroom but it seemed that the new counter in the kitchen was nicer (and warmer as a radiator sits underneath this window~!). 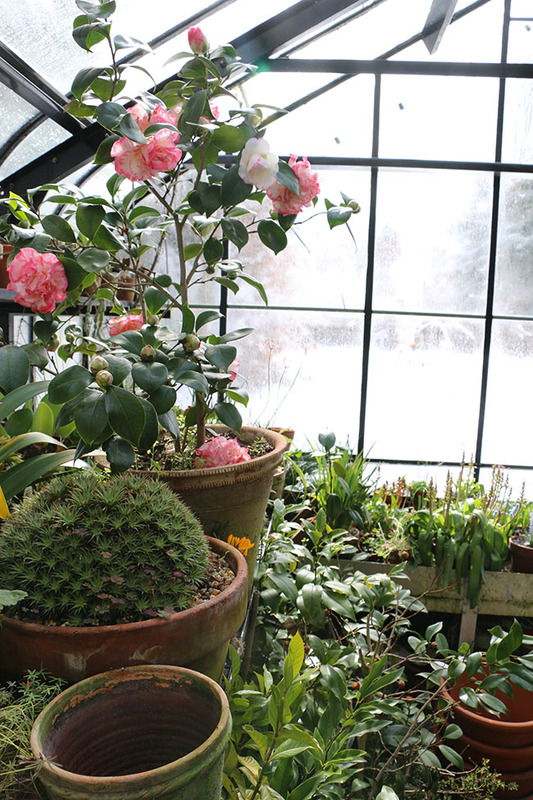 Our exceptionally cold January held-back many greenhouse plants including the camellias which are just now starting to put on a show. 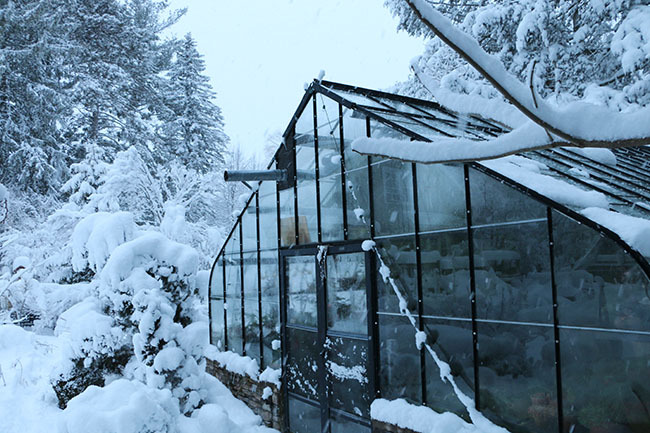 It's so late in the greenhouse season that the sun is strong enough to burn them on sunny days but with late snow storms arriving every few days we cant put shade cloth up yet as it will hold the weight of the snow. Such as weird winter or spring. This is how it looked two weeks ago with a dump of heavy, glue-like wet snow of just over a foot that broke and split most every Japanese maple and the following winds near hurricane force pulled down some hemlock trees, one hitting out chicken coop. 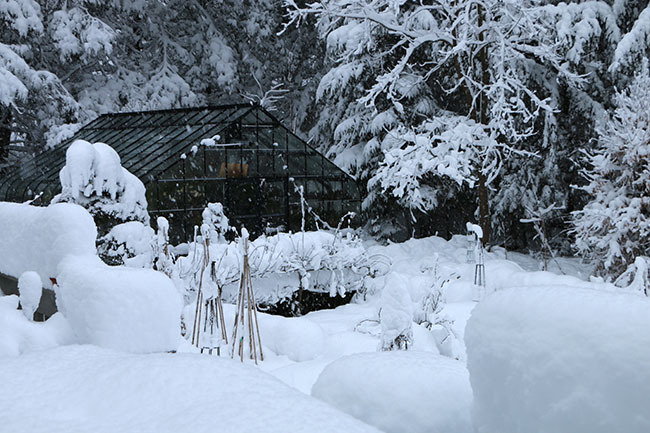 Last week, another foot of wet snow covering the onions in the garden and again breaking many trees. Luckily nothing hit the greenhouse. 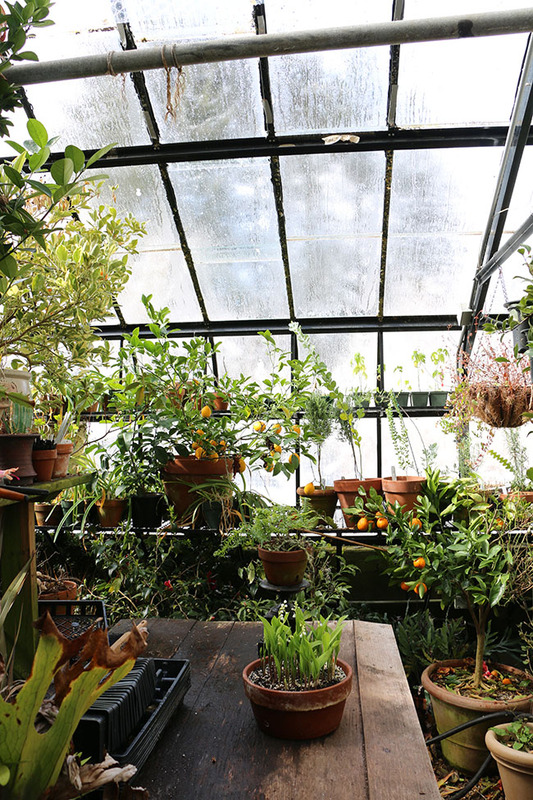 Inside the greenhouse things are pretty toasty though as the radiant sunlight heats it even on overcast days. 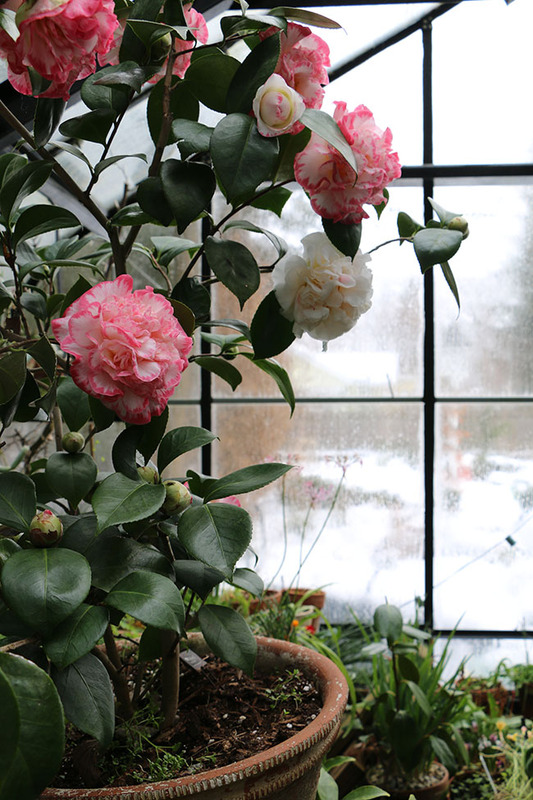 The last camellia season is still welcome maybe becasue the snow is still falling outside? 'Margaret Davis' is a particularly nice one and this year it sent out a few all-white sports. 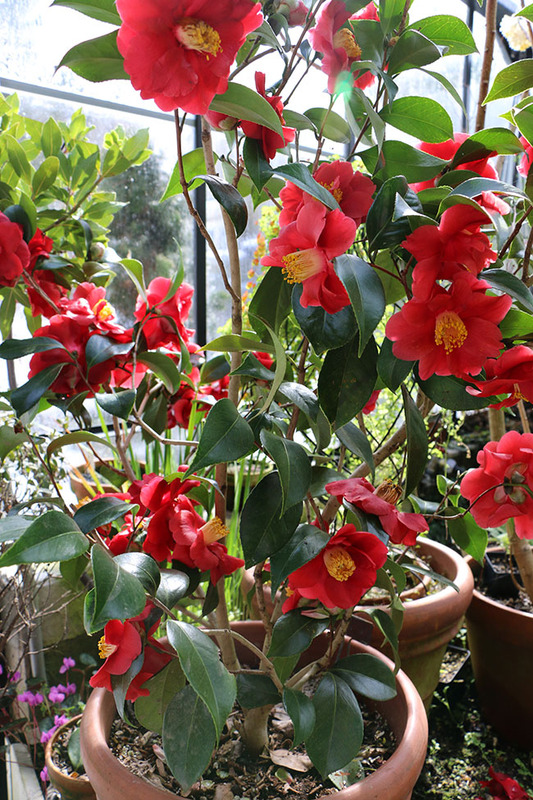 This camellia without a label is exceptionally floriferous this year. It's been in bloom since January. 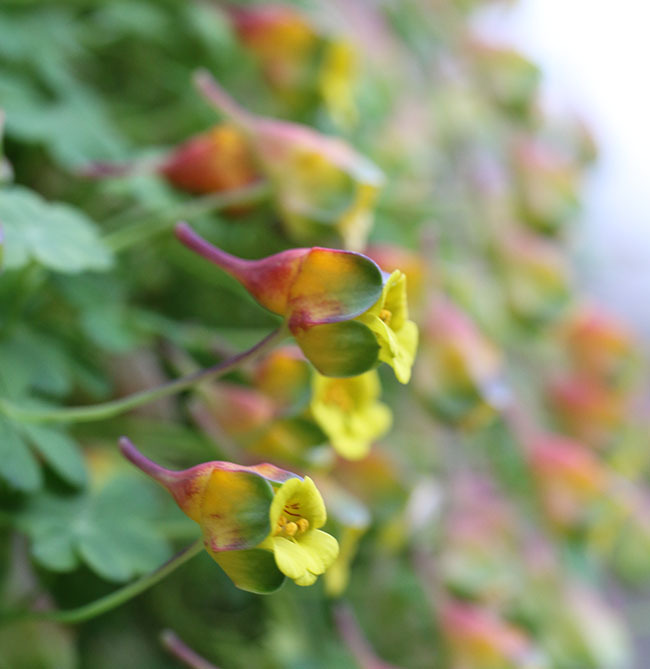 The tiny blossoms on the tuberous nasturtiums from Chile are back again and welcoming/ No bigger than a pea they come by the hundreds on this Tropaeolum brachyceras. Crocus love this weather, and these where bargain-basket 50 cent ones that I bought at Home Depot last January. They still grew and I planted hundreds becasue they were such a value. If these were tulips, forget about it, but often narcissus and crous can handle a bit of abuse. 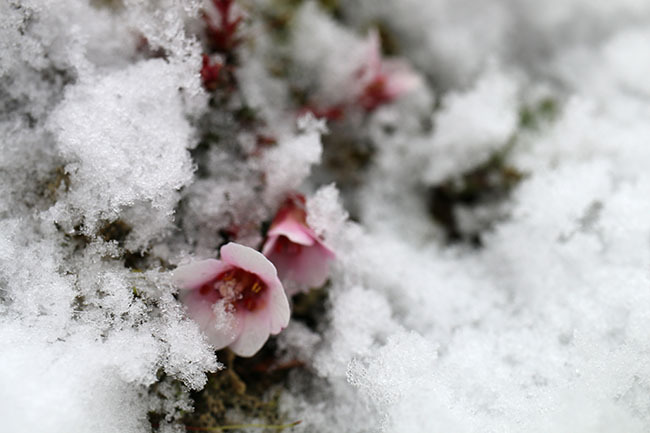 Alpine plants though are designed for this weather. This saxifrgaga growing in a piece of limestone rock relishes a late snowfall. I've seen these in the high alps in July blooming in snow. If you love rare or engangered plants consider the high elevation saxifrages in a colletion (get them from Wrightman Alpines) or at one of the spring plant sales hosted by local rock garden societies. As anyone at a table at one of these sales and they can direct you. 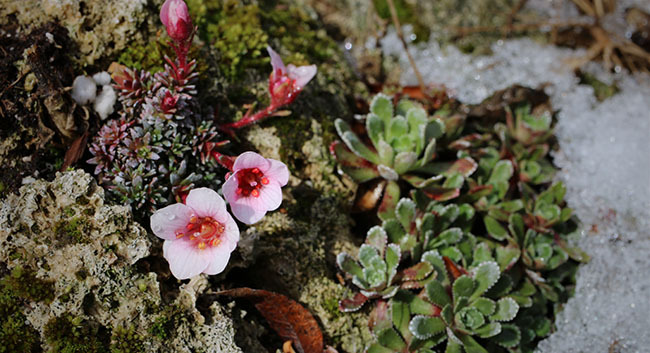 Saxifrages as hardy and tough, especially if grown in tufa rock - a porour limestone rock in which once they are rooted and set into a trough garden can last for years. Most of mine are over ten years old, and while a bit of a challenge to find if you fine the right place for them, they are rather care free. These troughs that sit on our deck are basically left alone year round. If you live in New York City or nearby, this is a great sale to hit. Alpine plants are not only important to save as our high-elevation zones are at risk from climate change and skiing resorts, these plants are perfect city rooftop or terrace plants (after all - tall buildings are just like mountains). These are plants that can handle wind, severe weather and most anything a balony can throw at them. They talke some knowledge to master but it's fun and interesting. Consider joining your local chapter of the North American Rock Garden Society as well (Far more than rocks! The society brings together folks who love woodland plants, native species, trees, shrubs, bulbs, ferns and most plant geeks join too!). 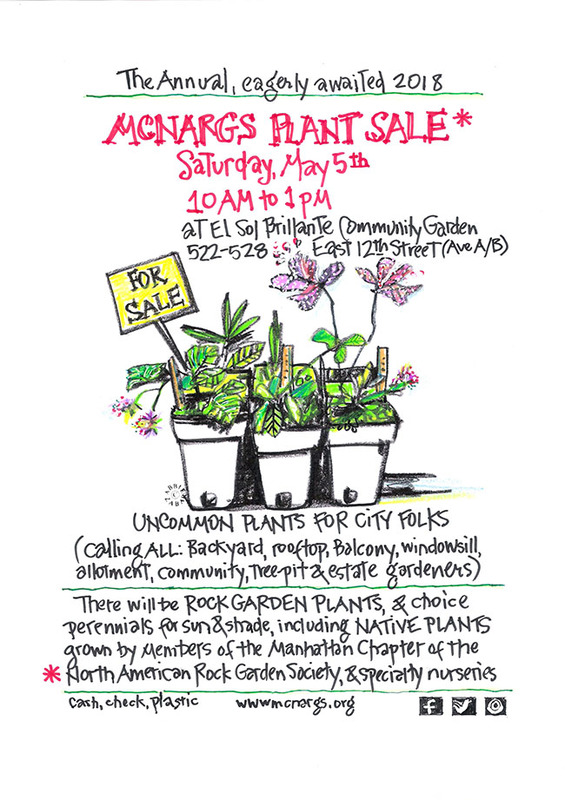 My dear friend Abbie Zabar who is a long-time member of the Manhattan chapter of NARGS designed this poster for them. Aren't they lucky in New York to have such generous talent? I first met Abbie at a NARGS national meeting in NYC about - oh geesh - maybe 18 years ago now. Boy, does time fly! In teh veg garden the first crop bold enough to face the weather has been the perennial bunching onions. 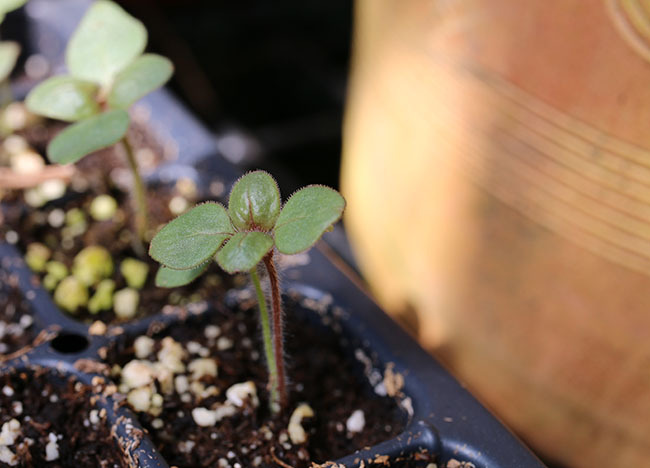 In the greenhouse, I've revised much of what I raise from seed given new knowledge which I write about in my book. I've stopped raising brassicas in early spring, no brocolli, cabbage or brussels sprouts once I learned why we shouldnt sow them now and things like snapdragons are kept dry between waterings to encourage thick stems. Parsley is a fav around here, but I learned much about researching parsley. I am growing six varieties as there are many fine types, and none are available at retail it seems. I want top chef restaurant quality. These won't see the outdoors until the temperatures warm to above 60 degrees, for I dont want parsley that will bolt and go to seed by July like those plants being sold right now at the nurseries will. 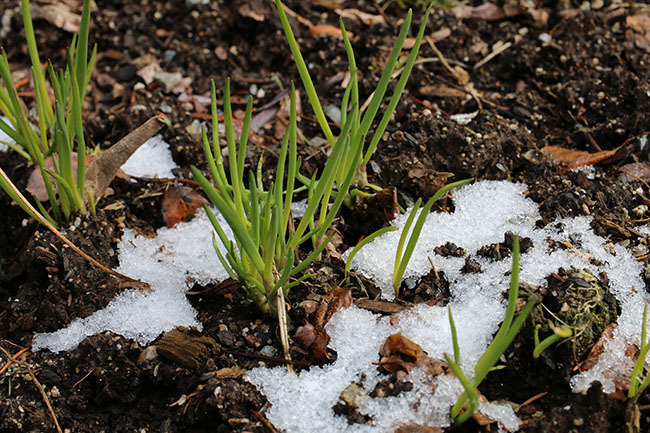 Parley and fennel will stop growing foliage and bloom if plants are exposed to temps below 50° F for even a few days. Pansies yes, parsley? No. Are you listening Lowes and Home Depot? One thing I learned last year was that chile pepper enthusiasts often save some types indoors, wintering them over in pots to continue growing the following season. It works best with the tepins and the rocotto-types, and mine are just starting to come out of this false dormancy. Kind of amazing. 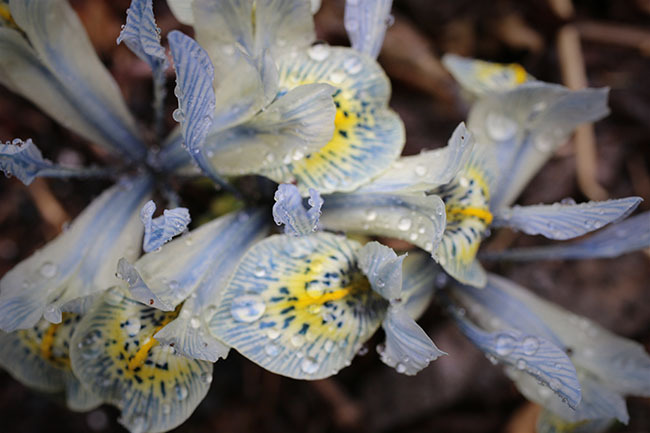 The Reticulata Group Iris often sold in catalogs as simple 'Iris reticuta' are early blooming bulbs that often emerge just after the snowdrops. "Katherine Hodgekins' is a perennial favorties of many gardeners, and this one is no exception. 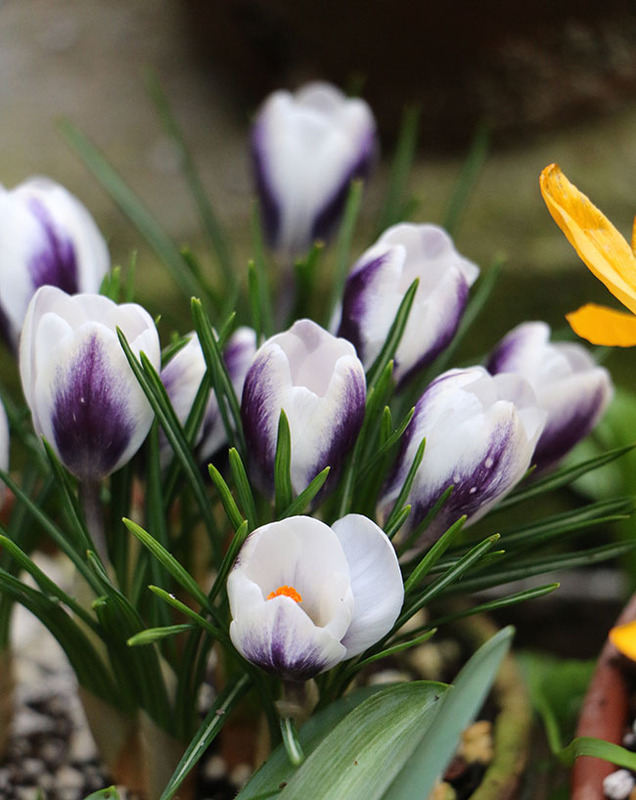 The species or snow crocus 'Prins Claus' is in a pot, but while hardy enough for the snowiest spring weather, in the greenhouse it can be apprecieated at a completely different level. It looks like a catalog photoshoot subject here.